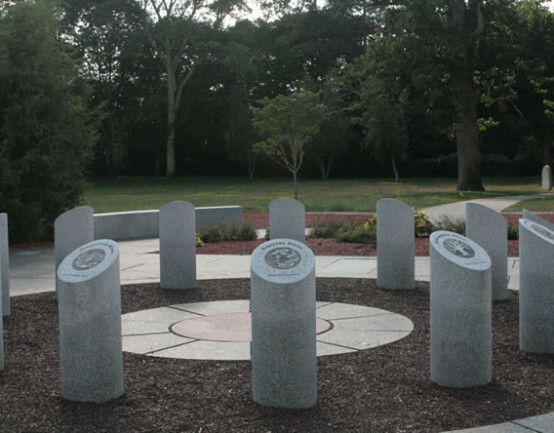 When Uncas allowed the English settlers to establish themselves in the nine-mile square, he reserved a condition to which the English agreed: that the sixteen acres on the plateau be kept in perpetuity as the Mohegan Burial Ground. Yet these sixteen acres disappeared bit by bit over the years, through property encroachment. In 1842 a young Mohegan woman, Emma Baker, accompanied her mother and grandmother to the Mohegan Burial Ground in Norwich only to find that cabbages were growing there. In an 1897 legal deposition she said, “We then went across to the ravine and on the edge of it someone made a pit and had a piece of pipe in it for the smoke to escape and they were burning some of the bones and bodies which they had dug up . . . She [her mother] said that the burial ground went beyond that and they had commenced to build on some of the land. From Yantic Street clear round to the Monument they were as thick as could be. I heard Mr. Fitch (the State overseer for the Mohegan Tribe), my grandmother and mother talking about the graveyard and they asked him to go and stop their building. ‘Oh,’ he said, ‘I did not know you cared about it.’” The overseer did nothing to stop this.